The federal government can, at times, be rather annoying. Tax time, for example, can be a bit stressful. Not for me, since my taxes are prepared by a middle-aged accountant who, like all middle-aged accountants, drives an Acura RL, like all middle-aged accountants. But maybe for you. Of course, regardless of your views on taxes, or Congress, or the president, I think we can all agree the single most annoying thing about government is its ban on importing cars. At the moment, the government does not allow any vehicles 24 years old or newer to be imported unless you plan to use it for “show and display.” Even then, there’s a list of cars that qualify for “show and display” and a separate list for cars that don’t. The car you want to import has to be on the “approved” list, which is probably created by a middle-aged bureaucrat who dreams of an Acura RL. 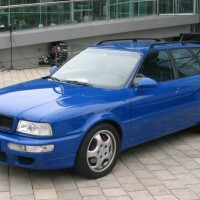 The Audi RS2 is on the denied list. Let’s back up to the RS2’s humble beginnings. 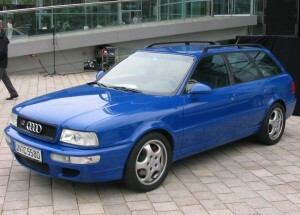 It was based on Audi’s “B4” generation 90, which came out in 1991. This was, by all accounts, the worst German luxury car ever, assuming you don’t count its predecessor, the Audi 80. But the RS2 was different. For one, it was a station wagon while most 90s were sedans. It had a 311-hp 2.2-liter turbo five-cylinder, a 4.8-seconds 0-to-60 time, and a top speed of 163 mph. Like the 500E featured earlier this week, it was built by Porsche in Stuttgart. It had “PORSCHE” lettering on its badge and brake calipers. In fact, it shared its wheels and mirrors with the 964. A Porsche-built Audi station wagon is, by definition, one of the coolest things in the history of time. But because it came out in 1994, we Americans can’t legally import one until 2019. Annoyingly, with laws that only extend out 15 years, our Canadian friends can bring it over right now, drive it to the border, and taunt us. I recently bought a scale model of the RS2, but the six-year wait for the real thing will be a long one. By then, my accountant may even upgrade to an RLX. My accountant drives a 10 year old Hyundai. I thought all the good CPA’s drove old, cheap cars while they put every dollar they had into shelters and tax loopholes? Good point. Actually, I think my accountant drives a Corvette. Maybe I should check things over a bit more closely this year. The only Audi cooler than this one is the B5 RS4 wagon that also never came here. And maybe the original Quattro coupe. I think this one is a *little* cooler than the B5 RS4 Avant, but maybe only because of the Porsche history. Maybe you’re right. Nothing like red Porsche brake calipers on a wagon to edge out the cool factor. Don’t forget the B5 RS4 has a similar connection. Engine was co-developed with Cosworth. For me the RS4 is better (used to own one) but the RS2 is the “cult-car” high performance avant. I just love the look of the B5 RS4, and the interior. The RS2 is definitely the more unique, more “cult” car. But the RS4 is a little faster, a little more technologically advanced, maybe a tad more reliable. I just like it. Really, both are awesome. The RS6 might be close with its TT Lamborghini engine, but that’s now. This was far before fast wagons were a common thing in Europe even. Exactly. This thing really started it all. Audi makes so many good cars they don’t bring over… I would absolutely buy an A1 tomorrow. Or an A3 cabrio. And the A5 Sportback is awesome. THE A3 IS COMING!!!!! REJOICE!!! !